Last week, I told you about the Pink Ribbon Luncheon, an event that raises money to provide services to breast cancer patients in Cincinnati. But that wasn’t the only way I got involved to help find a cure. On the last Saturday of September, the Pure Romance team and I participated in the Susan G. Komen Race for the Cure. 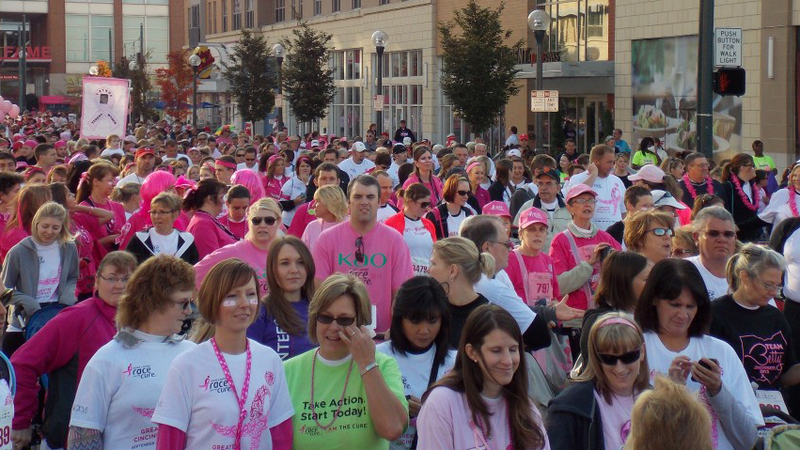 I look forward to this event each year, and the 2012 Race for the Cure was spectacular. Over 10,000 walkers and runners assembled outside of Cincinnati’s Great American Ball Park, and they were all sporting pink. I saw pink t-shirts, pink face paint, pink armbands, even pink balloon animals fashioned into hats. Many of the participants wore small signs or homemade t-shirts that told the crowd who they were honoring in the race. The dedication that struck me most was on the back of woman in her twenties. It read simply, “I’m running for my mommy.” I couldn’t help but notice that she was running alone. The race carried a festival atmosphere. When we arrived, a team of dancers was bouncing and shimmying across a stage as loud music played. The togetherness was palpable as people were laughing, hugging and chatting before the starting gun went off. This happiness and unity reminded me of the bravery of those women afflicted with breast cancer—to face what they face takes unquantifiable courage. I was overcome with the amount of men at the race because it illustrates a larger point—breast cancer is a disease that affects everyone. Finding a cure is a shared responsibility. Another sign of progress I noticed at the Race for the Cure was how people talked about fighting breast cancer. I saw stickers and signs that read “Save the Ta-Tas” and “I Heart Boobies.” Years ago, this would have never happened. No one worth listening to would have said “ta-tas” or “boobies” in public, but now we as a society feel more comfortable talking about our bodies. I love that. I never remember seeing so many strollers at the race before, and I am absolutely tickled about it. I am thrilled that children will grow up knowing how important it is to give back, to join a cause greater than themselves. We still have light years to go before we find a cure, and one of those kids might be the one that does it. I take solace in that. There is plenty of time left in October to do your part and help find a cure for breast cancer. And you know what? If you miss the opportunity to help out this month, there is always November. Together, we can make this debilitating disease a thing of the past. One Response to "Race for the Cure"
Thank you for setting the example for us all to do more!!!! I am so happy and proud to be apart of such a wonderful company! You touch so many lives and allow us to do the same on a daily basis. My grandmother is a Survivor and I walk every year in her honor.